The latest front to be opened up in the �war against obesity� is a campaign by the Food Standards Agency to encourage fish and chip shops to serve thicker chips, which absorb less fat and are thus supposedly healthier. The FSA scheme will cover Cambridgeshire, Greater Manchester and Northern Ireland by the end of this month. Officials will visit 80 chip shops to examine how much fat is in their chips and offer advice. If the pilot scheme is successful it will be rolled out across the country and last two years. Other small caterers including Indian and Chinese takeaways will be included. It is na�ve, though, to believe that this change can be sneaked in without anyone noticing it. As always, the possibility of unintended consequences is ignored. If the chips are no longer to their liking, people are likely to forsake fish and chips in favour of other fast food options which may contain even more calories and fat. I�ve said on here before that I prefer my chips to be slim, crisp and thoroughly cooked � Burger King on a good day is my ideal. 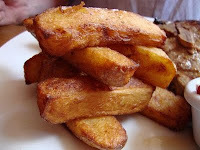 I already actively avoid chips in pubs because all too often they are flabby, half-cooked abominations. Now, if people actually prefer big fat soggy chips, then fair enough, but it is one thing to offer them the choice of the �healthier� alternative, something else entirely to give them no alternative. In future, I can only see the scope of such arm-twisting initiatives widening. I continue to believe that within the next five years were will see brewers being �encouraged� to �vountarily� reduce the strength of popular beer brands in a bid to cut alcohol related health problems �something that to a limited extent has already been happening, in particular with Stella giving up its 0.2% ABV strength advantage over most of its direct competitors.